Neil Young was born Neil Percival Kenneth Robert Ragland Young on 12th November 1945. Neil Young is a singer and song-writer whose work is characterized by deeply personal lyrics, distinctive guitar work, and an almost instantly recognizable nasal tenor voice. Although he accompanies himself on several different instruments including piano, banjo, and harmonica His style of hammer-on acoustic guitar and often idiosyncratic soloing on electric guitar are the lynchpins of a sometimes ragged, sometimes polished, yet consistently evocative sonic ambience. 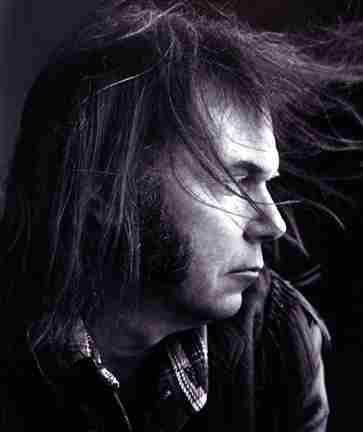 Neil Young has experimented widely with differing music styles, swing, jazz, rockabilly, and electronica throughout a varied career, his most accessible and best known work generally falls into either of two distinct styles: an acoustic, country-tinged folk rock, as heard in songs such as "Heart of Gold" and "Old Man," or a grinding, lumbering form of hard-rock,as in songs like "Cinnamon Girl" and "Southern Man." He first came to prominence as a member of the folk-rock band Buffalo Springfield in the mid-1960s and then as a solo performer backed by the band Crazy Horse. He reached his commercial peak during the singer-songwriter boom of the early 1970s with the albums After the Gold Rush and Harvest as well as with Crosby, Stills, Nash and Young. He has long been distrustful of commercial management in the music business, and has at times created highly accessible and durable popular music while at other times has indulged in outlandish and uncompromising experiments that have left audiences, critics, and his record label baffled. 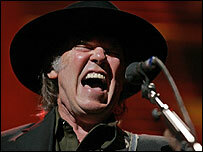 Neil Young was inducted into the Canadian Music Hall of Fame and the Rock and Roll Hall of Fame.